Cephalopods are any of the species of mollusks assigned to the taxonomic class cephalopoda (meaning "head-footed"). 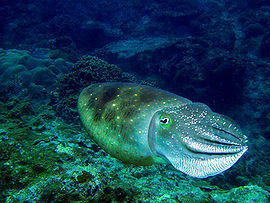 People usually think of a squid, but there are many kinds in this class including the nautilus, octopus, and cuttlefish. The main characteristic of them is long tentacles and arms attached on their body. Tentacles and arms can only observed be in cephalopods. Using tentacles and arms, they catch prey like fishes, clams, crabs and feed themselves, so that they can survive in the open sea. Cephalopods live all around the earth from the water surface to the deep ocean floor. To move in the water, they contract their muscle and use jet propulsion to provide locomotion. Some species have external shells to protect the body while others have internally. Also, they can change their body color to avoid predators, or to be a predators, or communicate with one another. They are all carnivorous and sometimes squid eats other kind of squid. They have a closed circulatory system and an acute nervous system. There are 800 kinds of cephalopods existing nowadays. Some species are provided to people as foods but they also hurt people by appearing along the beach. For the respiratory system, the most important organ is the gill, which is located in the mantle cavity. After they draw in water through the siphon, the mantle contracts itself and forces the water through the gills. Slow or stationary cephalopods have a large gill while quick-moving ones have small gills. The reason that small gills are for fast ones is that the water needs to be passed quickly so that jet propulsion can occur in short time. In contrast, the slow or stationary cephalopods do not need to have small gills to pass the water rapidly. Cephalopods have the most developed and complex nervous system among the all invertebrates. They have groups of ganglia and form a brain. The brain is separated into parts that each of them controls specific functions like the way vertebrate do. Cephalopoda not only have advanced nervous system but also great senses. Especially, they have good vision to detect the prey or predators. 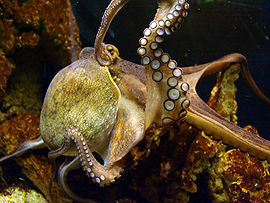 For example, common octopus can determine the brightness, size, shape, and horizontal or vertical orientation of objects. Although they can detect those well, but poor at deciding colors. According to Hanlon and Messenger 1996, most of cephalopods are blind in colors. Moreover, they have only one pigment using in vision while humans have three. For structure of their eyes, they have square-shaped pupils and change its shape of pupil to narrow rectangle by the amount of lights. To get the image, they receive lights through the pupils and focused by lens. 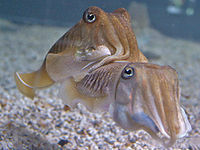 Class cephalopoda are gonochoric that they have separation in sexes. The females have only one oviduct and the males produce spermatophore. There are many ways that they transfer the spermatophore to the females. Most of species have an arm called hectocotylus is used to transfer spermatophore to the females. Then the spermatophore goes into the oviduct and get fertilized. During the courtship between cephalopods, there might be color changes or body movements, and sometimes both of them happen. The male changes his color into the brightest color as bright as he can and if the female becomes pale, it means that she accepts him. However, she remains in her color, it represents that she recognizes it as a dangerous situation to her. Also most of them are semelparous that they lay eggs a lot at one time and die, but nautiloidea is exception. Nautiloidea lays eggs in each time and lives long. The cephalopod's fertilized ovum is divided into germinal cells and yolk uniquely without having larval stage. The germinal disk forms into a embryo getting nutrients from yolk. Then the arms, tentacles, head, and mouth appear in orders. The cephalopods are absolutely marine animals. They live in open sea freely all over the world. (Porch, Batdorf, p470) Sometimes they live under rocks. They catch crabs, fishes, bivalves, and even other squids as their preys. At the Baltic Sea, no cephalopods can be observed because of low salt concentration. However, they are found in Suez Canal where the saline levels are much higher than the oceans. This shows that concentration for salines affects the habitat for cephalopods. As they live in open sea which is a dangerous place to survive, they own some defense features. Some species can change their color to fit in the environment not to be attacked or to attack others. For Nautilus, they have external shell to protect themselves. Cephalopods can be food to human beings. Some species like calamaris are provided as food with lots of proteins. However, they also can give human discomfort. During the summer, a large group of cuttlefish or squids emerge along the beach or sea shore. They can hurt people or make people to have hard time to catch fish. Their habitat is full of prey and hostile predators. To survive in such an environment they need to conceal themselves. Camouflage can be used not only to protect from predators, but also to sneak up on prey. There are many ways to blend with the environment. Counter shading is when the upper half part has dark color while the lower part has light color. When the cephalopod is observed from the above, the dark color would be resembled to the color of sea floor. Moreover, when it is watched from the bottom, it would be blend with the water surface. (Porch, Batdorf, p511.) Sepioteuthis sepioidea demonstrates this case well. Color changes and skin texture are altered to pretending to be an object like coral or sea weed. To communicate with the other species and also same species, they change colors. The most noticeable color change of communication is aggression between males. Particularly during the mating, the male tries to prevent the other males not to attempt the female that he wants to mate. For example, cuttlefish and squids make the zebra patterns. In some species of squids, they can color differently into two sides. For one side closer to female, they color to attempt her to mate and on the other side, they color the zebra patterns to scare other males. It is called double signaling. Also, during the male's courtship, female can color pale to express that she does not want the mating with him. Class Cephalopoda Kristen Wheeler, Daphne G. Fautin, Animal Diversity Web, 2001. The anatomy of swimming in cephalopods Carl Howard, jrscience.wcp.muohio.edu, 2003. Cephalopod vision Dr. James Wood, Kelsie Jackson, publisher, date. Cephalopod(class of mollusca) encyclopedia of Britannica. Introduction to Cephalopods Dr. James B. Wood , The cephalopod page. The Cephalopoda Jann Vendetti, UCMP, 2006. A Broad Brush History of the Cephalopoda Dr. Neale Monks, The cephalopod page. Cephalopod International Advisory Council CIAC. This page was last modified on 16 August 2014, at 04:52.